More than 2.1 million people were working in Alabama in August, which breaks the previous employment record for the fourth consecutive month. That’s according to a Friday-announcement made by Alabama Department of Labor Secretary Fitzgerald Washington. 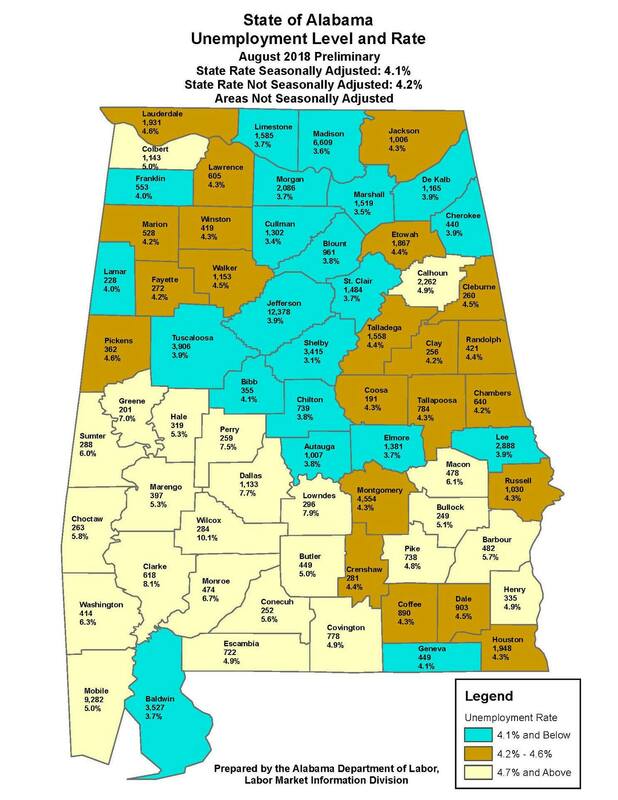 2,112,274 Alabamians were counted as employed in August 2018, up from 2,105,577 in July, and up 32,101 from August 2017’s count of 2,080,173. The civilian labor force, which is composed of people who are working or looking for work, increased over the year by 36,929, up to 2,203,485, compared to August 2017’s count of 2,166,556. Professional and Business Services employment currently measures 252,100, the highest level ever experienced. General and Operations Managers at $59.46/hr. Software Developers, Applications at $45.36/hr. Alabama’s preliminary, seasonally adjusted August unemployment rate is 4.1 percent, unchanged from July’s rate, and slightly above August 2017’s rate of 4.0 percent. August’s rate represents 91,211 unemployed persons, compared to 90,928 in July and 86,383 in August 2017. In August, 64 of 67 counties saw their unemployment rates decrease or remain unchanged, 25 of 26 major cities, and all metros saw either a decrease or no change in their rates from July to August.